At the age of ten, I took up the clarinet. I was going to be the world's greatest musician. 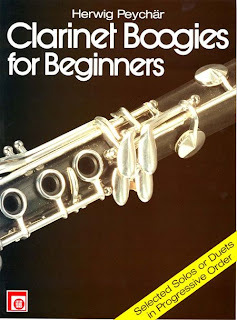 From the moment I first wrapped my lips around that clarinet mouthpiece, I knew that suddenly the keys would make sense to me, and I would play a beautiful and very touching tune that would make my band teacher weep. How hard could it be? Pretty hard, it turns out. There are so many holes in the clarinet. And these button things you have to hold down in random combinations. And you have to blow into it in a certain way so that the reed doesn't squeak. And stuff like that. "Take your clarinet home and practice," our teacher reminded us. And did I? At first. And, boy, was I popular. "Play us a song!" my grandparents would request, and I would entertain them with a few bars of "Go Tell Aunt Rhody." At the end of my performance, while my grandparents lamented the old gray goose and their eardrums, I would feel reassured that I was indeed the best musician of all time. But soon, my grandparents lost interest, and it was up to me to simply practice of my own volition. With no captive audience, I found the clarinet to be rather boring. Not to mention that it made our dog howl. So my practices became shorter and shorter, until one day I just started to "forget" to bring it home every night. "We paid $400 for that clarinet," my parents said. "You have to practice." "Sure, sure," I replied, barely looking up from Nancy Drew and the Case of the Mysteriously Broken Clarinet Reed. On the rare occasion I did bring it home, I shoved it into my oversized book bag and pretended I just had a lot of studying to do when my friends got suspicious. At the age of thirteen, I took up the piano. "Look at me! I'm Jerry Lee Lewis!" I cried as I pounded out "The Rainbow Connection." "That's good," said my piano teacher, "but your left hand isn't moving." "But it's so haaaaaard to make my hands do different things at the same time!" I would whine. And my piano playing days were numbered. "Hey, I know," I said at 15, "I'll take up the guitar!" And so I convinced my parents to buy me one for my birthday. Two weeks later: Chords! I don't understand! And so I gave my clarinet to my sister, my guitar to my brother, and only tinkered with the piano at Christmas when I needed accompaniment for my famous one-woman rendition of "Carol of the Bells." Singing! Oh, yes. That was perfect. Who needs a musical instrument when you can sing? And so at 16, I decided to become a famous singer. Because if I really concentrated, I could do a pretty convincing mimic of Patsy Cline. "Sweeeeeeeeet dreams of youuuuuuuuuu!" I crooned night and day. And as Patsy spun in her grave and the glass in our bathroom windows rattled, I convinced myself that I was the best singer in the world. It was about that same time that that hack Lee Ann Rimes became famous and stole my thunder and someone told me that I was too fat to be famous. So I didn't ever get famous through my musical ambitions. Will I ever? No. And will the music enjoying public be missing out on something great? Perhaps. I do look pretty awesome in faux leather. Ha, I also attempted the clarinet and piano (three years of expensive piano lessons and all I can play is "Heart and Soul," which my mom taught me). I also had ambitions of being a great singer. So in 6th grade, I taped myself singing along with Mariah Carey's "Vision of Love." I think singing along to early Mariah is a very good way to determine the viability of your own singing dreams. Now I'm a writer. I played clarinet from sixth grade through my junior year of high school, by which time I was burned out by it all. Sometimes just seeing a band play gets that old reedy taste in my mouth (that sounds dirtier than it is). For a while, I was good. Made all-region band in eighth grade. Then I just stopped caring. I tried to take a piano class in college, but quit when I was basically the only beginner in beginning piano. you're hilarious! i, too, asked for a guitar. my mom bought me a crappy one from FingerHut. i was under the impression that you just hold it and strum it and voila! oh...there's actual learning involved. within a week i stepped on it "accidentally" and my mom got so angry. my little sister, after watching Selena, decided she wanted to be a singer. her father bought her a microphone and a speaker to hook it up to. ALL DAY AND ALL DAMN NIGHT we were serenaded with her favorites: "Techno Cumbia" or "Amor Prohibido" and don't forget "Como La Flor." but that wore off...around the same time that she came across Selena's funeral pictures. WEIRD.